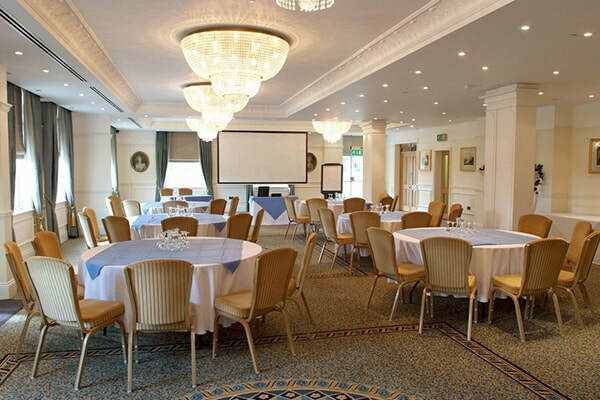 Set the tone for a successful meeting or business event at Orsett Hall in Essex. 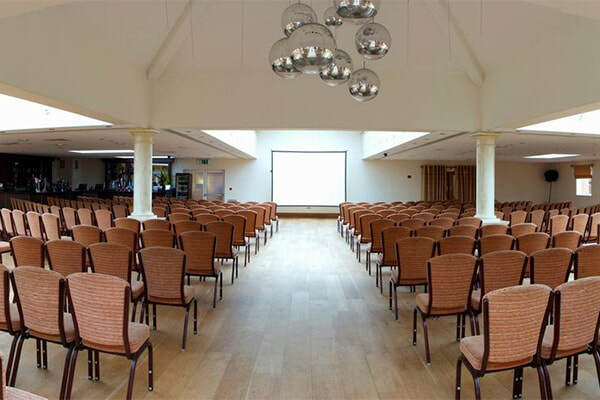 Whether you’re hosting an intimate seminar for 10 or a large conference for 500, we have a venue to suit your requirements; we also offer extensive grounds, ideal for outdoor activities and team building events. Energise your guests with delicious, customised catering, and trust our experienced team to assist you with every aspect of your event, from start to finish. 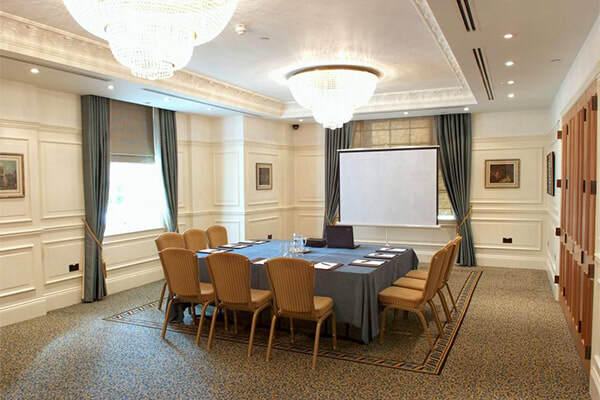 A Georgian style room complete with a period fireplace, crystal chandeliers and rich carpets, the Gold Room is 156 square metres in size and can accommodate up to 120 delegates. Situated on the ground floor, it offers ample natural light and double aspect views over the gardens. The room incorporates a full public address, sound, music and lighting system and is fully air-conditioned. Internet service is available. The Gold Room also features a private patio with covered heated seating and a bar facility. The room is fully accessible. Adorned with rich colours and fabrics, this 220-square-metre ground floor room is located outside the Pavilion and is suitable for meetings and small exhibitions of up to 150 delegates. Fully air-conditioned and with Internet service available, the Whitmore Suite incorporates a full public address, sound and lighting system. A private patio with a covered heated seating area and a bar facility are popular features. The room is fully accessible. The Jaguar Bar enjoys a quiet location on the lower ground floor close to the Pavilion. This 86 square-metre room can accommodate up to 50 delegates or up to 100 guests attending a private function. 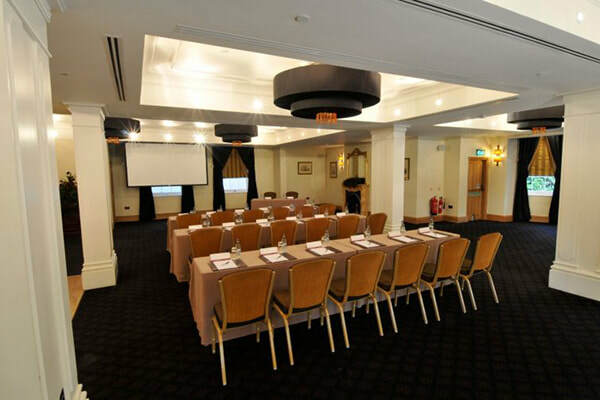 Fully air-conditioned and with Internet service available, the venue includes a mirrored ceiling and a conference plasma screen. There is an adjoining private seating area, which is suitable for breaks and buffet lunches. The room is fully accessible by stairs or a lift. One of the largest event venues in the area, this stunning purpose built conference suite is 575 square metres in size and can accommodate large exhibitions and trade shows of up to 450 delegates. This impressive space is the largest of our suites; it is fully air-conditioned and offers ample natural light. Large floor-to-ceiling French windows open on to private patios, featuring a covered heated seating area. The suite incorporates a full public address, lighting, sound and music system, as well as Internet access and ample telephone and power points. A private bar facility is available. 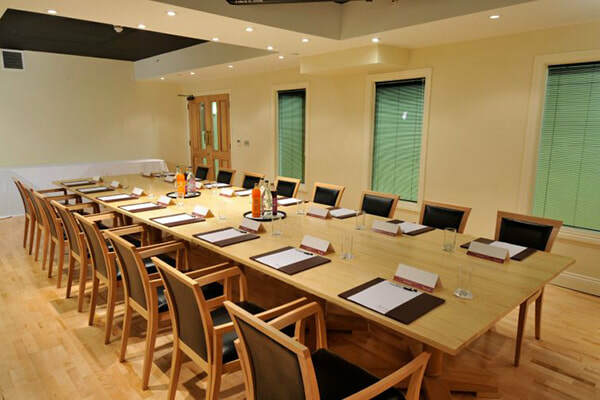 The Boardroom is situated on the lower ground floor and enjoys a quiet location. 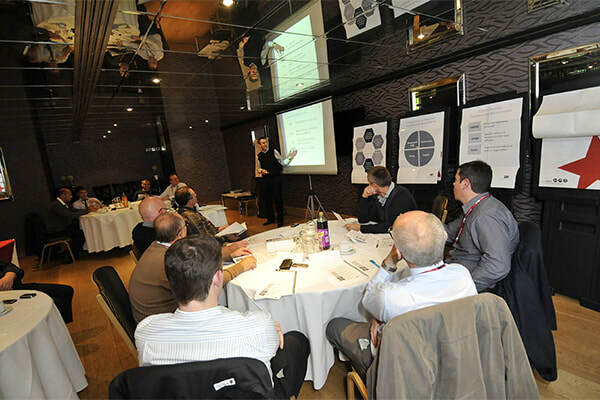 It is 45 square metres in size and can accommodate up to 20 delegates, making it perfect for off-site meetings and seminars. The venue is fully air-conditioned and offers Internet service. There is a space in the room for teas, coffees and buffet lunches to be served without any disruption to your event, and the room is fully accessible by stairs or a lift. The Keane Room is located on the second floor of the hotel and enjoys a quiet location away from the hustle and bustle of the main reception area whilst remaining fully accessible by stairs or the lift. This modern room is 15.5 square metres in size and can accommodate up to eight delegates for off-site interviews and meetings. It is fully air-conditioned and offers Internet service. The 51 square-metre Blue Room is suitable for smaller meetings and private dinners of up to 30 people. Fully air-conditioned, the room benefits from ample natural light and views overlooking the fountain and gardens. Internet service is available. The room is fully accessible.